For those that haven't seen this link - please have a look as it's a an awe-inspiring 360 interactive panormic image of the milky way (may need a bit of time to load though!). I've found myself idly browsing it several times and as an astronomy layman I wondered if anyone could help me navigate what I'm looking at. While I can orientate myself and visualise where we are in the milky way, what is the distinctive black band? I'm assuming it is caused by the absence of stars in these areas. However, as I understood it, the disc (as well as the center) are the areas of highest concentration of stars. Are these 'gaps' caused by dark matter? The black band is not absence of stars, but rather clouds of gas and dust — a significant component of almost all spiral galaxies$^\dagger$ — which block the light of background stars and luminous gas. In the image, you see both individual stars, scattered all over, and the distinctive bright band of the Milky Way, most of the stars of which are so far away that they blend together. Most of the dust is in the plane of the Milky Way. The individual stars are closer to us than the bright band and the dust clouds, so what you see is the billions of stars in the Milky Way band, some of the light of which is blocked by dust, and then on top of this you see a few 1000s individual stars that are closer. Galaxies consist of roughly 85% dark matter and 15% normal ("baryonic") matter. By far, most of the normal matter is hydrogen and helium, some of which is locked up in stars, and some of it in huge gas clouds, sometimes glowing (the pink clouds you see in the Milky Way image are probably hydrogen clouds being excited by the hard UV radiation from hot and massive stars, subsequently emitting H$\alpha$ light). A small fraction (1–2%) of the normal matter are heavier elements, by astronomers lazily referred to as "metals". Roughly 2/3 of the metals are in the gas phase, but the remaining 1/3 has depleted into dust grains, e.g. silicates and soot. This dust is mixed with the gas clouds and often become dense enough that they block light of stars. Dark matter cannot be seen. It's… well, dark. It interacts with normal matter and light only through gravity. That means that if you could place a lump of dark matter in front of a star (you can't, really), you wouldn't block its light. It would pass right through. If the lump were big enough, it might gravitationally deflect the light, so the background star would look distorted to you, as would a lump of normal matter (e.g. a black hole). $^\dagger$In contrast, the interstellar medium of elliptical galaxies tend to be much more gas- and dust-depleted. Pela has a nice answer, I'll just add my 2 cents. While I can orientate myself and visualise where we are in the milky way, what is the distinctive black band? I'm assuming it is caused by the absence of stars in these areas. 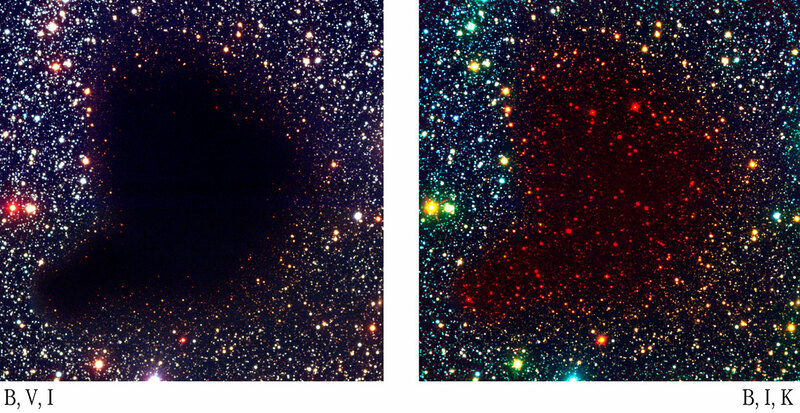 The black band probably blocks some of the more dense areas of stars, not a lack of stars at all, with the exception, I think, for the larger dark area on the far left, which might be a lack of Milky-way stars. I believe that window of low star density is where Hubble spends most of it's time looking into deep space. Also, consider which is brighter a flashlight 6 inches from your eye or a car head-light 60 feet away. The center of our galaxy may be a lot brighter, but we're pretty far away from it, so the relative brightness we see of the Milky way is more evened out. A lot of the light in that white streak we see is coming from relatively close stars. It's a very different perspective than our view of Andromeda where the center stands as much brighter. However, as I understood it, the disc (as well as the center) are the areas of highest concentration of stars. You can see it gets a bit thicker in the center and the brightest part is the lower-center. The bright center is there in the picture, it's just largely blocked by gas and dust. Are these 'gaps' caused by dark matter? Dark matter is essentially invisible to all light, unless there's enough of it to bend light, then it can be observed indirectly. The most basic reason is that the human naked eye cannot see all parts of the electromagnetic spectrum. There are a lot more stars than what we see on a regular basis, probably lying in the infrared region. Not the answer you're looking for? Browse other questions tagged milky-way photography or ask your own question. How are the photos of the Milky Way taken?